To Cite: Mihandoost Z. Treatment Programs for Students With Attention Deficit Hyperactivity Disorder: A Meta-Analysis Study, Iran J Psychiatry Behav Sci. 2015 ; 9(3):e1840. doi: 10.17795/ijpbs-1840. Context: The aim of this study was to determine the experimental evidence of treatment/intervention programs for deficits in social skills, attention, and behavioral disorder in children and adolescents with attention deficit hyperactivity disorder (ADHD). Evidence Acquisition: Meta-analysis procedures were employed to investigate whether children and adolescents with ADHD exhibit deficits in attention and social skills. A total of 17 empirical research studies published between 2000 and 2013 met our inclusion criteria. Attention and social skills measures were categorized according to both modality and type of processing required. Results: Children with ADHD exhibited deficits in multiple components of attention and social skills that were not related to language-learning disorders and weaknesses in general intellectual abilities. The overall percentage effect for attention and social skills in students with ADHD was calculated (effect size = 0. 79, confidence interval = 0.57 - 1.08). This meta-analysis study showed that treatment programs reduced attention deficit and social skills in ADHD children and adolescents. Conclusions: The evidence of attention and social skills deficits in children with ADHD supports recent studies in ADHD deficits. Further research is required to explain in detail the nature, severity, and specificity of the deficits in individuals with ADHD. Attention-deficit/hyperactivity disorder (ADHD) is a psychobiological disorder that is described by attention deficit, hyperactivity, and reduced impulse control. Based on the diagnostic and statistical manual of mental disorders, Fifth edition (DSM-V), ADHD is a “persistent pattern of inattention and/or hyperactivity and impulsivity that interferes with functioning or development. The inattention manifests behaviorally in ADHD as wandering off task, lacking persistence, having difficulty sustaining focus and being disorganized, and is not due to defiance or lack of comprehension. Hyperactivity refers to excessive motor activity (such as a child running about) when it is not appropriate, or excessive fidgeting, tapping, or talkativeness (1).” Based on DSM-V results, several symptoms appear before the age of 7. The 3 subtypes that are related to ADHD include predominantly hyperactive, predominantly inattentive, and a combination of one or more of the aforementioned types. A child must demonstrate at least 6 of the 9 symptoms and adolescents must demonstrate at least 5 of the 9 symptoms in a cluster form before the 3 subtypes (1). Past research illustrated that symptoms related to hyperactivity may decrease as the child grows older, while the child’s inattentiveness remains relatively unchanged (2, 3). Barkley defined the main characteristic of ADHD as difficulty in behavioral inhibition (4). Unintentional behavior possessed by the child diagnosed with ADHD appeared to affect their academic achievement throughout their academic career. In addition, these children displayed problems with their social skills and difficulty communicating, due to the apparent frustrations with their academic performance (5). The DSM-V shows that the rate of ADHD was greater in males than in females, with a ratio of nearly 2:1 in children and 1.6:1 in adults (1). There are dissimilar theories on the subject of the causes of attention deficit. Attention deficit includes the combination of biologically determined reactivity of the nervous system and failure to self-regulate, and environmental disturbances (6, 7). Students who cannot centralize their thoughts are impatient and evoke negative responses from their environment, which can provoke a perception of social refusal. The continued experience of refusal at school mixed with the vulnerability of the child/adolescent nervous system is thought to produce negative perceptions, evoking compensatory behaviors, such as, aggressive comic behavior, feeling alone, and/or a depressive status. To decrease such symptoms, the creation and protection of a supportive and caring home situation would appear to be an important factor. Students must have a feeling of being accepted, the ability to develop trusting relationships, and also a belief that there are methods that can help them. This situation can be quite difficult to achieve if the parents displays symptoms similar to their child. ADHD indicatorsare not just limited to childhood, and the relative dynamics of this disorder may cause the condition to persevere. Based on previous studies, the principal treatments of ADHD have focused on the use of medication, behavioral, cognitive, cognitive-behavioral, and neural treatments (8-16). A review of the literature between 2000 and 2013 identified the multimodal treatment of ADHD for the ADHD child and/or adolescent. These combination treatments include self-control, self-regulation, cognitive, cognitive-behavioral, cognitive play, behavioral play, motor-perceptual rehearsal, functions management training, verbal self-education training, education of children by parents, positive therapy, training of parents, parental constructive program, and training of stress coping skills. These studies demonstrated that the mentioned treatments were more successful and had longer lasting effects on attention deficit, social skills, and behavioral problems in ADHD than the singular medication treatment or behavioral therapy (17-28). In this meta-analysis study, the researcher used published journal articles and theses on the topic of the effectiveness of intervention/treatment programs on ADHD from the scientific information database (SID), the Iranian research institute for information science and technology (IRANDOC), the national library and the archives of the Islamic Republic of Iran (NLAI), and the United States national library of medicine (NLM) and national institutes of health (PubMed) websites during 2000 - 2013. Database search was performed with the following keywords: treatment program and ADHD, intervention program and ADHD, and instruction. In the preliminary database search, 72 related articles were obtained from SID, 64 dissertations and abstracts from the IRANDOC website, 23 dissertations and articles from the NLAI website, and 175 dissertations and articles from the PubMed website. All findings were screened for inclusion, based on the title and abstract, using the following restrictions regarding the treatment/intervention program on ADHD. This study’s concern was interventions/treatments intended to improve ADHD. After reviewing the preliminary articles and theses on ADHD, a total number of 17 articles were screened for possible inclusion (Table 1). a Abbreviation: ADHD, attention deficit hyperactivity disorder. These articles had to meet each of the subsequent criteria: the article must have been an original investigated report (experimental, quasi-experimental research), included treatment of at least one independent variable, and the students must have been diagnosed with ADHD. Articles excluded if they did not meet the above criteria, and if the students’ Intelligence quotient scale (IQs) were below 90, or if data for the ADHD students could not be separated from data of the group without ADHD. A total of 17 articles were screened for inclusion in this meta-analysis. In the present study, the researcher employed coding procedure (40). A coding structure and operational definitions were made to record quantitative information from each of the 17 studies. The following areas were employed for coding purposes. In this study, the research design was classified as experimental and quasi-experimental. The specific kind of design was recorded (e.g.pretest or posttest). 1. Preparation training treatments were categorized as either content area preparation or self-regulation preparation. 2. Direct training treatments included teacher-led, explicit, and systematic training. 3. Behavioral treatments included treatments in which the employment of positive reinforcement was dependent on the successful completion of an assignment. 4. Practical treatments contained treatments in which the child was candidate for reiterative performance of an ability that was intended to be already within the student’s repertoire, for example: the student would stay for an extra 20 minutes to read the task. 5. Textbook modification included any treatment that modified an original textbook to decrease its stage of difficulty. 6. Combination treatments included the combination of two or more of the treatments. 7. Play treatment (such as aerobic activity and yoga). 8. Pharmaceutical treatments used were Ritalin, methylphenidate, and dextroamphetamine. 9. The final category included any intervention that did not fit in the above-mentioned categories such as cognitive treatment, cognitive-behavioral treatment, and short-term executive function training. In this study, the researcher employed 17 ADHD studies. The data collection of each study is illustrated in Tables 1 and 2. Moreover, the mean and standard deviations of pretests for the 17 ADHD studies are illustrated in Table 3. Furthermore, mean and standard deviations of posttests for the 17 ADHD studies are provided in Table 4.
a Abbreviations: ADHD, attention deficit hyperactivity disorder; CGI-S, clinical global impressions-severity; CSI-4, children symptom inventory-4 (screens for ADHD and other emotional and behavioral problems); DSM-IV, diagnostic and statistical manual of mental disorders; GAF, global assessment of functioning; SSRS, social skill rating system; WIS-R, wechsler intelligence scale for children-revised. b A test to measure ADHD children. a Abbreviation: mean ± SD, standard deviation. a Abbreviation: SD, standard deviation. 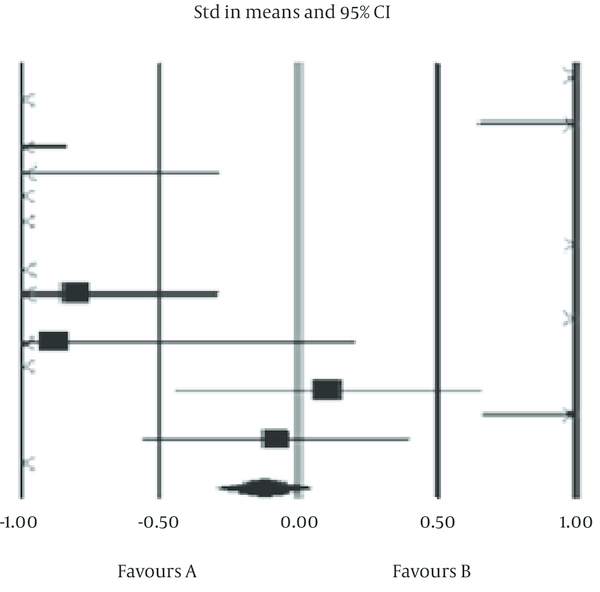 To facilitate statistical analysis, the researcher used continuous means as a part of unmatched group from comprehensive meta-analysis software. The results are separated into 3 parts: a) mean, b) standard deviation, and c) sample size for each group. To test treatment results of experimental and control groups which were different, the effect size on all samples of each group was calculated. Significance testing was performed. Means, standard deviations, and Cohen’s d are given in Table 5.
a Abbreviations: LL, low limited; SD, standard deviation; SE, standard error; UL, upper limited. The results of the study illustrated that there is a difference between the mean scores of the experimental and control groups. The overall meta-analysis of these studies illustrated a statistical significance (Figures 1 and 2). In addition, overall standardized differences in means ranged between 0.79% and 95%, confidence interval ranged between 0.57 and 1.08, and Z-value was equal to -1.45 (d = mean d = -0.68 (look at below of Equation 1 and Equation 2)). Furthermore, the Q statistic for heterogeneity of 347.74 is statistically significant (P < 0.001); in addition, I2 = 95.40, T2 = 9.44, SE = 4.30, s2 = 18.41, and Tau = 3.07. (Summary data of standardized differences in means of the fixed-effect model). The standardized differences in means is -0.128 and the 95% confidence interval is -0.301 - 0.046 and P = 0.148. The horizontal line represents the primary standardized differences in means for each study, and the vertical lines represent the standard error where available. This study found several interventions that can reduce symptoms of ADHD in children and adolescents. Based on pooled effects, the mentioned treatments can reduce social skills difficulty and behavioral problems. According to the study by Cohen, low effect is below 0.20, median effect is 0.50, and high effect is 0.80 (41). This should be taken into consideration, as there were a range of intervention and evaluation methods. These overall results described that about 75% of children and adolescents in the experimental groups showed a greater reduction in symptoms of ADHD than children and adolescents in the control groups. Effects from studies on far transfer of working memory therapy, cognitive-behavioral therapy and neurofeedback, and ritalin and the combinations of drugs prescribed reduced the symptoms of ADHD in higher percentages of children compared to the control group. The aim of this study was to perform a comparative study on the effects of treatment programs in reducing ADHD symptoms in children. Results of this study demonstrated that treatments with the highest levels of effectiveness (> 0.80) included cognitive-behavioral therapy, pharmacological treatment, and combinational treatment. This study, like the meta-analysis by Nigg et al. showed that treatment programs reduced symptoms of ADHD in children and adolescents (42). The difference between overall mean change for treatment and control groups ranged from -0.08- to- 4.45. This showed that the groups receiving treatment programs illustrated significantly larger improvements in term of ADHD symptoms. Consistent evidence from both experimental and quasi-experimental studies suggests that treatment programs had desirable effects for the majority of ADHD studies (43, 44). Effective treatment programs for ADHD students reduced problems in social skills and academic performance, and behavior disorders, which are the cause of the disruption of daily life functioning. These treatment programs are a necessity for children with ADHD in order to overcome the challenges that accompany an ADHD diagnosis over the course of their education. Consequently, improvements in daily life functioning and decreasing of functional disorders are the important, socially suitable standards against which treatment results must be evaluated. The majority of studies regarding effective treatment programs on ADHD illustrated that treatment programs are effective on ADHD. In this meta-analysis, the treatment programs used included cognitive treatments, cognitive-behavioral treatments, behavioral treatments, pharmacological treatments, and combinational treatments. Previous studies have demonstrated that students, who received treatment in the various therapy programs, had a higher potential of being mainstreamed into society and showing improvement in their academic and social skills in comparison to students who did not receive some types of therapy. Based on the findings of this research, it is recommended that cognitive-behavioral treatment and pharmacological treatment be used for a higher rate of success in aiding with the ADHD symptoms in children and adolescents. The authors wish to thank the editor of the Iranian journal of psychiatry and behavioral sciences for providing us with important feedback to improve the paper. Authors’ Contributions: Zeinab Mihandoost conceived and designed the study, collected and interpreted the data, drafted, and revised the manuscript, and approved the final version of the manuscript. Declaration of Interest: The author declared no potential conflicts of interest with respect to the research, authorship, and/or publication of this article.